"The person who does things that count..."
"Sometimes, the Lord calms the storm..."
"The best and most beautiful things in life..."
Thank you. Through all that you're doing for our mission – your support, your encouragement, your enthusiasm and prayers – you are keeping KNOM on the air. We offer special thanks to our supporters who are spreading the word about KNOM: to their friends, family, parishes and communities. As you'll read on below, word of mouth is an immensely powerful way for Western Alaska's stories – and KNOM's – to be known in the Lower 48 and beyond. We're so grateful that you're helping us tell these stories every day. 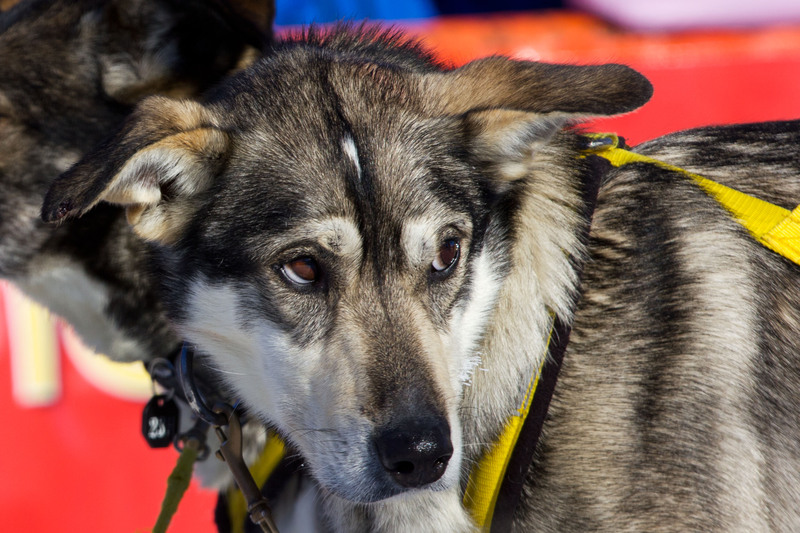 In March, we truly had some incredible stories to tell, and many of them had to do with one of Alaska's biggest events: the Iditarod Trail Sled Dog Race. 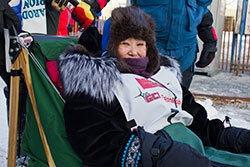 This year's Iditarod was very special to our region; the 2011 race saw the record-breaking, championship finish of Western Alaska's own John Baker, a musher from the Arctic town of Kotzebue (COT-suh-byoo, on the northern fringes of our listening range) and the first ever Native Inupiaq man to win the Iditarod. 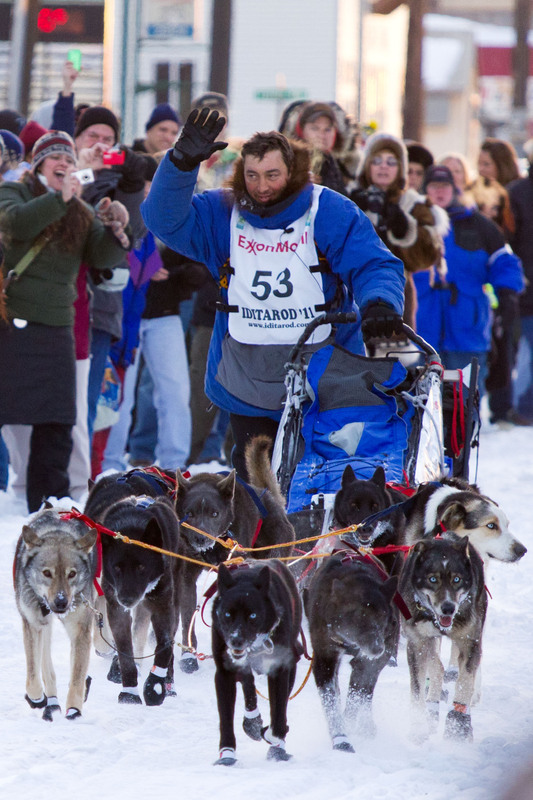 As excitement and joy reverberated throughout Alaska with Baker's finish, we also paused to remember our friend and founder, Tom Busch, who supported and reported on the Iditarod from its very first race. You'll find more below. 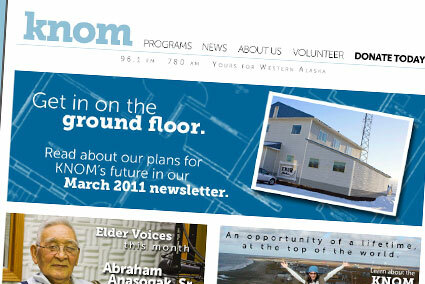 March was also filled with another sort of excitement, as KNOM unveiled a brand-new, completely redesigned website (at knom.org), with new features and resources for our community, our listeners, our potential volunteers, and all those who support us. We invite you to read more below and, of course, to continue to visit us on the web! As always, you remain in our thoughts and prayers. To paraphrase what one listener recently told us, "you are always there when we need you." Thank you, immensely, for being there for all of us in Western Alaska. It's more than a facelift: it's a completely redesigned, rebuilt-from-the-ground-up overhaul. If you haven't seen it already, KNOM has a brand new website (at knom.org). What's new about it? Aside from a new look, it's full of new features. Our listeners can now interact with our most popular programs - such as call-in and music request shows - directly on the site, and there's much more information about KNOM's history, its staff, programming, volunteer program, and lots more. There's more to listen to - such as downloads of our newscasts, our long-form news stories, and new inspirational spots - and more to explore, with links to our latest photographs (on the photo-sharing site Flickr) and to our social networking outlets on Facebook and Twitter. 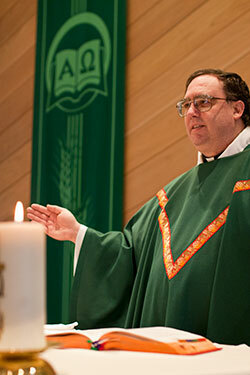 We hope that our new site will give you a new way to interact with our mission, and we encourage you to visit it today. There's so much to see: knom.org. What happens to us is not as important as what happens through us. 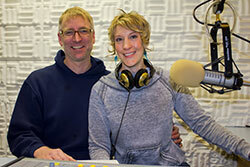 We pass on a note of thanks from a longtime KNOM listener in St. Michael, Alaska. I thank KNOM for saying the Holy Rosary through the air and the Holy Mass through the air. I follow the Rosary and Holy Mass. Thank you KNOM. Sincerely yours. St. Michael is a village of 370 people located on the Norton Sound coast, 160 miles southeast of Nome. The dire shortage of priests means that, like in many villages in Western Alaska, Catholic Mass is celebrated in St. Michael only sporadically. As a result, the faithful in St. Michael often rely on KNOM to participate in the Sunday liturgy: whenever possible, we broadcast Mass from St. Joseph's church in Nome (usually officiated by Father Ross Tozzi, seen at left). And our liturgical broadcasts aren't limited to Sundays; we air the Rosary and the Divine Mercy Chaplet each and every night. Across Western Alaska, they're among our most popular programs. The person who does things that count doesn't usually stop to count them. 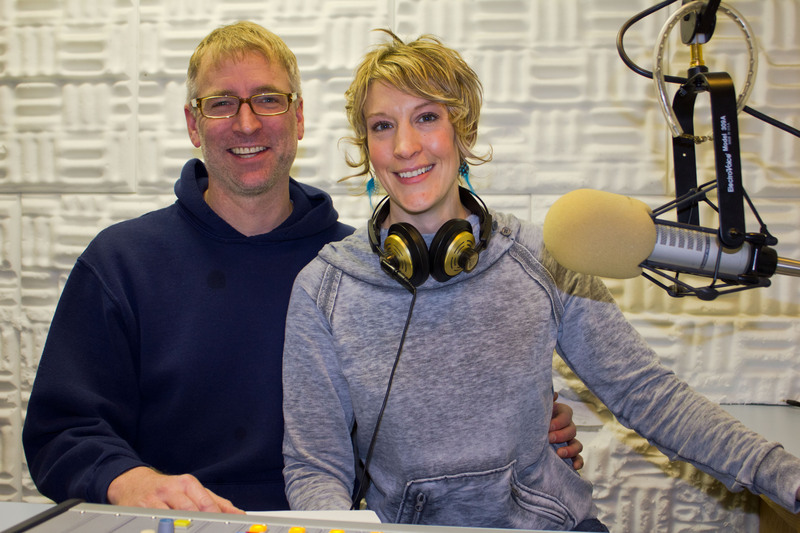 As we wrote in the March newsletter, KNOM is making plans for an expansion and complete renovation of its Nome studios, a project that would convert our broadcast equipment from analog to digital. This conversion is long overdue and will be essential to our mission's future, and thankfully, we have help in making it happen. 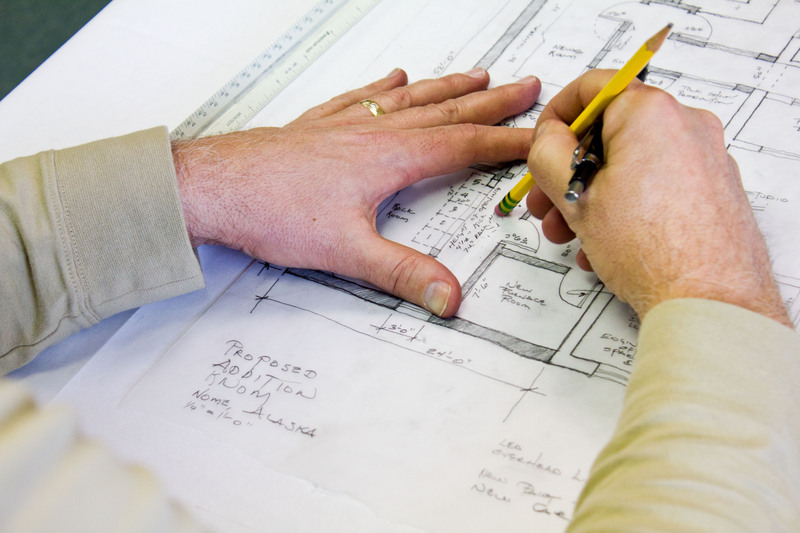 Architect Frank Schmidt - general manager Ric Schmidt's brother - recently volunteered his services to tweak our future studio's blueprints and to take notes on our current studio building (see photo above). Thanks, Frank! From time to time, local or state police ask us to help find a missing person. For the families of the missing, this is a moment of great uncertainty and distress, especially in light of Western Alaska's extreme weather and its acutely high rates of alcoholism and destructive behavior. In these crises, we do what we can to help, working closely with law enforcement throughout the search process. Recently, a young woman was reported missing in Nome. We broadcast her description and her last known whereabouts, and within a half hour, she had been found. We have been told by listeners that family members feel better knowing KNOM is working hard to help police locate their loved one. Tragically, some missing persons are never found, but it's because of your generosity that we've seen so many happy reunions. Thank you. As we mentioned above, word of mouth is so vital in telling the KNOM story. We're so grateful for all our donors have done to expand our KNOM family; they've found creative ways to spread the word about our mission. One supporter got the word out through her column in the Catholic New World, a newspaper of the Archdiocese of Chicago. If Chicagoans think they've had "enough snow," she wrote, "think of the stalwarts at KNOM, broadcasting 24 hours a day on the tundra. The oldest Catholic radio station in the United States, it airs news, music, call-in shows, weather, and emergencies, as well as the Mass, Rosary, the week's scripture readings, inspirational spots, and (the) storytelling of Alaska Native cultures." She even noted, astutely, that donations to KNOM "are tax-deductible." Very true. In Kensington, Maryland, KNOM supporters have also used the power of the written word: this time, in printed flyers about KNOM that they've distributed at Sunday Mass. And in San Francisco, a KNOM donor organized a "Just for Fun" luncheon and fundraising event that drew a crowd of over 50 people, ranging in age from 7 to 90. She chose to generously give KNOM half the proceeds. In all of these ways – and in many others, too numerous to mention here – your efforts are making our mission possible. For going above and beyond in your generosity and devotion to KNOM, we can't thank you enough. Sometimes the Lord calms the storm; sometimes He lets the storm rage and calms His child. 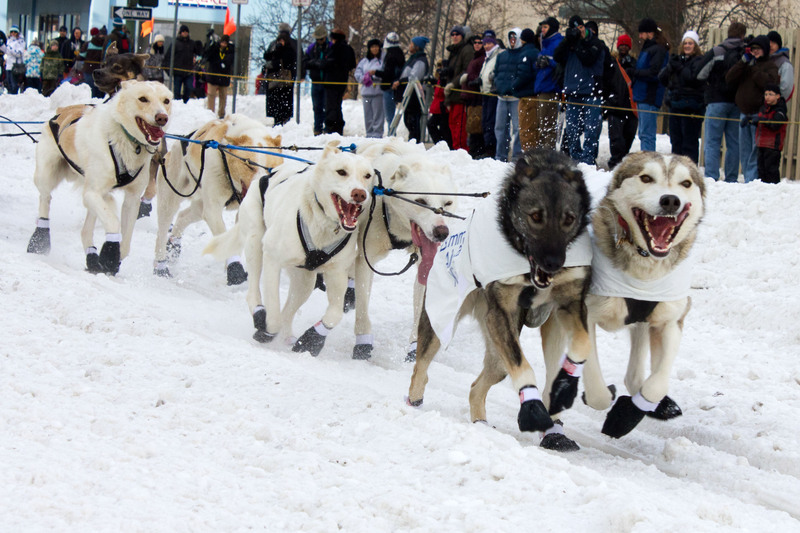 It's an event that unifies and excites Western Alaska like none other: the Iditarod. A sled-dog race of over 1,000 miles from Anchorage to Nome, it's one of the highlights of our broadcast year. We're proud to provide full coverage of the race, and we're humbled by the amount of support we receive to do so. The best and most beautiful things in life cannot be seen or even touched; they must be felt by the heart. 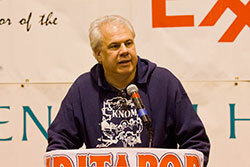 The 2011 Iditarod was a very special one for Western Alaska and for KNOM. Not only did one of our own - Kotzebue's John Baker (photo top left) - win the race in record-breaking time, but this year's race was also an opportunity to celebrate the broadcasting heritage of our friend and founder, Tom Busch, who passed away last year. 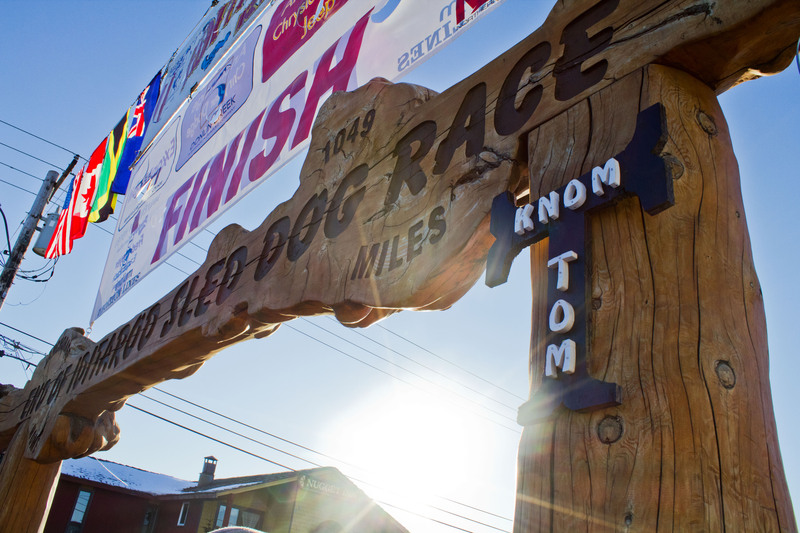 The Iditarod Trail Committee acknowledged Tom's many years of supporting the Iditarod by naming him - and KNOM Radio - the honorary musher for this year's race. 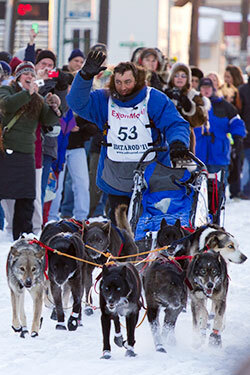 At the ceremonial start in Anchorage, Tom's wife Florence (KNOM's former business manager) proudly wore honorary bib #1 as she rode in one of the sleds that departed the starting line (see photo, second from top). 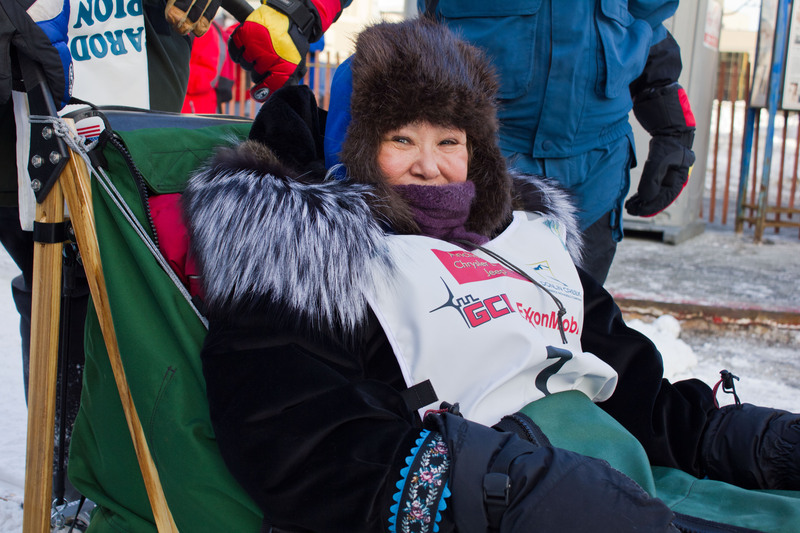 At race's end, all of this year's mushers added their signatures to Florence's Iditarod bib. 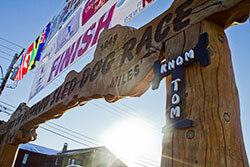 This was the first race in Iditarod's history - and KNOM's - that did not benefit from Tom's encyclopedic knowledge and support of the Last Great Race. 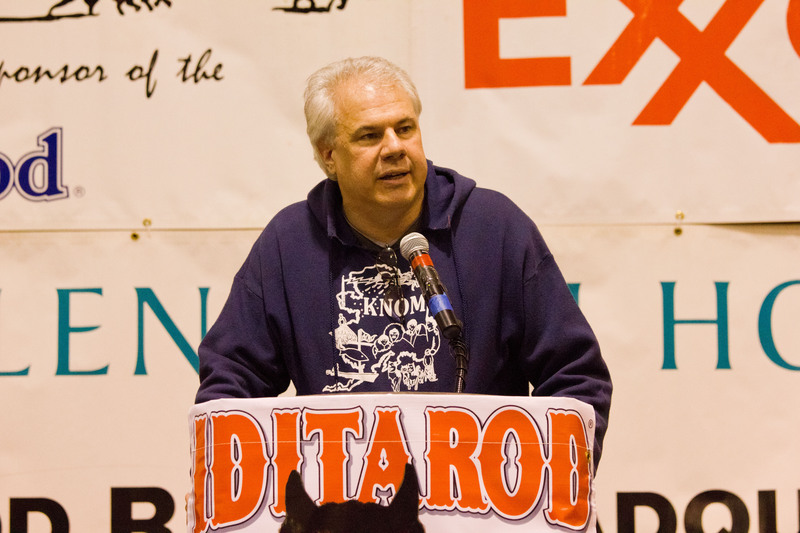 But as general manager Ric Schmidt declared at this year's Iditarod banquet (photo bottom left), all of us at KNOM know that Tom's broadcasting legacy will continue to inspire and guide us for many years to come. This year's Iditarod belonged not to one champion, but to two. Thank you, Tom.